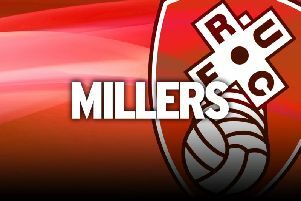 Rotherham United made their first foray into the January transfer market on Friday evening, with the capture of midfielder Matt Crooks from Northampton. The 24-year-old has been on the Millers' radar for some time and joins for an undisclosed fee on a three-and-a-half-year deal. He passed his medical at the AESSEAL New York Stadium having agreed personal terms on his lengthy contract. Crooks has scored six goals in 23 appearances for the Cobblers in League Two this season and has also had spells at Rangers, Accrington and Scunthorpe. His arrival in South Yorkshire is a timely boost, following news that striker Jamie Proctor is likely to miss the rest of the season. The striker, who was ruled out for most of last term with a serious knee problem, has suffered more heartache after requiring surgery on a hip problem ahead of Saturday's crucial visit to Ipswich. He went under the knife earlier this week and Warne does not know if the former Bolton striker will be seen again this campaign. "I think his season could be over," Warne said. "We noticed he was struggling with his movement so investigations have been done into why. The surgery went okay. He has been very unlucky. "Jamie had a bad year last year. This season he was going well but now he's had a massive setback." Proctor made his return after 12 months out at the start of this season, but despite penning a lengthy new deal in the autumn, the 26-year-old has made only 18 appearances this season and most of them have been from the bench. His lengthy absence heightened Warne's need for fresh blood this month, but and Crooks' arrival appeases some early frustration in the market. He expected to sign a Premier League striker this week, but his target went elsewhere. "There were other clubs in for him and unfortunately it didn’t end with us getting him," Warne added. "We were as competitive as we could be." Meanwhile, left-back Ben Purrington was recalled from his loan spell at AFC Wimbledon and immediately sent back out to fellow League One side Charlton. Purrington, who has failed to win Warne over, has been one of the Dons' best performers in a struggling side and now moves to a team fighting for promotion.